Iranian President Mahmoud Ahmadinejad arrived in Rome on Tuesday to attend the United Nations summit on global food security. “I do not believe that my declarations create problems,” Ahmadinejad told summit goers via an interpreter. “People like my comments, because this way the public can save themselves from the imposition of the Zionists. “European peoples have suffered the greatest damage from Zionists and today the costs of this false regime, be they political or economic costs, are on Europe’s shoulders,” he said. Ahmadinejad later warned Israel is “doomed to go,” saying it is what he called a “fabricated regime” that will disappear. He said this will happen with or without Iranian involvement. 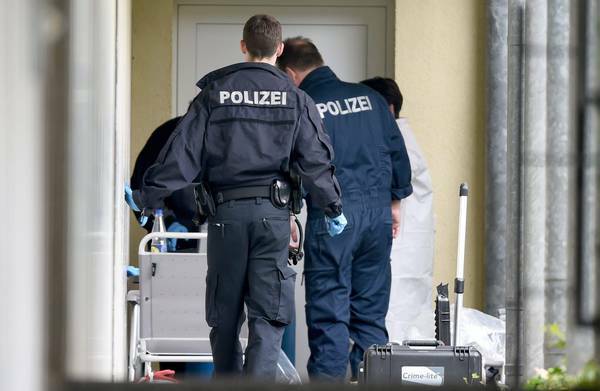 A German court ruled that a Muslim man who admitted stabbing a rabbi did not intend to kill him. * How so? He attacked him and called him a ‘Jewish Pig’- didn’t he? Rabbi Zalman Gurevitch, who was stabbed by an Afghanistan-born man on a street in Frankfurt last September, during the trial. The man identified as Sajed A., a German of Afghan ancestry, was sentenced to 3 1/2 years in jail by the Frankfurt District Court for the September stabbing of Rabbi Zalman Gurevitch. Sajed, who said he was acting in self-defense, was convicted of causing grievous bodily harm. Had he been convicted of attempted murder in a bias case — as the rabbi’s attorney, Rolf Doering, had argued — Sajed could have been jailed for 15 years. Gurevitch, who required an emergency surgery after the stabbing, is planning to appeal the sentence based on the grievous bodily harm conviction, according to reports on the Spiegel Online magazine. The rabbi testified that he had been on his way home from Sabbath services on Sept. 7 when Sajed shouted at him, “S— Jew, I will kill you,” and stabbed him in the stomach. Sajed later said he had been driven by fear of the rabbi, who was the larger of the two men. Some witnesses said the two men had argued before the stabbing. Der Spiegel said this could not be verified because two Jewish witnesses who live abroad said they were afraid for their safety and would not testify. The Frankfurt Regional Court on Tuesday morning convicted a 23-year-old German-Afghans to three years imprisonment for serious bodily injury. The accused stabbed the rabbi in September 2007 in Frankfurt. After yelling insults at the Rabbi who was on the way to the synagogue the Afghan rammed a knife in his belly. The “German”‘s name is Sajed Aziz. What do you think? A neo-Nazi? Or maybe…just possibly…influenced byÂ Islamic antisemitism? * Take a look at Pat Condells fan mail..! CANNESÂ (AFP)—A French film championing freedom of expression against attempts by Muslim activists to censor caricatures of the Prophet Mohammed highlighted a key front in the culture wars at the Cannes festival. “It’s Hard Being Loved By Jerks” by Daniel Leconte takes as its subject a bitter legal battle by the editor of a French weekly who was acquitted last year on charges of offending Muslims for reprinting the offending cartoons. Strasbourg, 20 May (AKI) – The European Court of Human Rights is to consider claims from eleven terrorism suspects that they suffered psychiatric damage when they were imprisoned by the British government. GUANTANAMO BAY U.S. NAVAL BASE, Cuba, May 20 (Reuters) – A Saudi citizen who allegedly intended to be the “20th hijacker” on Sept. 11 tried to kill himself last month at the U.S. prison camp in Guantanamo Bay, Cuba after learning he faced charges that could carry the death penalty, his lawyer said on Monday. Berlin — The German interior minister said Tuesday that the emancipation of women within Germany’s Islamic communities was the key to continued social integration. The minister’s Christian Democratic Union party (CSU) places great emphasis on what it sees as family-based western European values, including the integration of Islam in an open and moderate form. Islam is Germany’s largest minority religion. Since the 1960s the country has experienced large scale immigration from predominantly Islamic Turkey and the avoidance of segregation is a key aim for both sides of Germany’s ruling grand coalition. In the same interview Schaeubler said that German children should be speaking German at home. At present many children from immigrant backgrounds do not encounter the national language until they start to attend kindergarten. His comments are fuel for the ongoing debate about the status of Islam in the country. The German government is a supporter of Turkish entry to the European Union but many hardliners argue that an Islamic country has no place in Europe. I finally managed to put it up! Bear with me while I’m learning this program, but I’ve been watching this story unfold for a while now: The former East Germans are par tout against this Ahmadiyah mosque, 90% of them are against having to hear the call to prayer over their rooftops 5 times a day and won’t have the government impose it on them. A citizens’ group in Berlin turned out this week for a candlelight vigil to protest plans for a new mosque in their neighborhood. It will be the first to be built in the former East Berlin, where almost no Muslims live — but no one can quite explain why it shouldn’t be there. A member of the Ahmadiyya Muslim community in Berlin stands in front of a sign that reads, “There is no God but Allah.” The community has just won approval for a new mosque in an eastern district of the German capital. Please click on the link above for the whole thing! “Juden und Christen sind dem SchweiÃŸgestank von Kamelen und Dreckfressern gleichzusetzen und gehÃ¶ren zum Unreinsten der Welt…Alle nichtmuslimischen Regierungen sind SchÃ¶pfungen Satans, die vernichtet werden mÃ¼ssen.” Dies ist nicht etwa ein Zitat eines durchgeknallten Muslims aus dem finsteren Mittelalter. Kein Geringerer als Ayatollah Khomeini, hÃ¶chster schiitischer Geistlicher und in der Hierarchie der Schiiten somit gleichzusetzen mit der Rolle des Papstes im Christentum, qualifizierte mit eben diesen Worten auf zahlreichen seiner Ã¶ffentlichen und weniger Ã¶ffentlichen Veranstaltungen pauschal alle Christen, Juden und sonstige “UnglÃ¤ubige” der Welt ab. In den 80er Jahren fanden seine Worte kaum international Beachtung. Heute jedoch, im Jahr 6 nach den verheerenden AnschlÃ¤gen in New York, in einer Zeit eines global gewordenen islamischen Terrorismus, wird zunehmend klar, dass sie der verbale Auftakt einer weltweiten Kampfansage seitens radikaler Muslime gegen den Rest der Welt waren: Wie selten zuvor in seiner Geschichte zeigt sich der Islam in seiner fundamentalsten und archaischsten Form. Global â€“ sowohl in islamischen wie auch in nicht-islamischen LÃ¤ndern – kÃ¤mpfen fanatische muslimische “Gotteskrieger” fÃ¼r den Siegeszug des Islam und fÃ¼r die unmittelbare und am Wort klebende Umsetzung der Suren des Koran. Bei den Suren handelt es sich um sog. “Verbalinspirationen” – also um wortwÃ¶rtliche EinflÃ¼sterungen Allahs, des “einzigen und wahren Gottes”. FÃ¼r die strengglÃ¤ubigen saudischen Wahabbiten spricht Allah die Sprache des Koran, arabisch also. Folgerichtig muss Allah Araber und die arabische Nation das auserwÃ¤hlte Volk Gottes sein. Jede Kritik an auch nur einem Wort des Koran, und mag es noch so unbedeutend erscheinen, wird noch heute als GotteslÃ¤sterung in den meisten muslimischen Staaten bestraft, in Saudi-Arabien etwa gar mit der Todesstrafe. Im Prinzip darf der Koran auch heute nicht in andere Sprachen Ã¼bersetzt werden, da eine solche Ãœbersetzung allein schon die arabische Sprache Allahs verfÃ¤lsche und eine Interpretation des arabischen Ursprungstextes beinhalte. Weltweit mussten und mÃ¼ssen die KoranschÃ¼ler den Koran daher in seiner Ursprungssprache lerne. Meist verstehen sie davon nicht mehr als eine phonetische Lautfolge einer fremden Sprache. Die Ãœbersetzung und Interpretation der koranischen Inhalte war jahrhundertelang ausschlieÃŸlich Korangelehrten vorbehalten. Die GlÃ¤ubigen hatten kritiklos das zu glauben, was ihnen vorgetragen wurde. Die interpretatorische und theologische Machtstellung der Imame und Ajatollahs war und ist bis zum heutigen Tage unumstritten. Denn an mehr als 200 (!) Stellen ruft der Koran zur Verfolgung, ja zum Mord an “UnglÃ¤ubigen” auf. Das ist einzigartig innerhalb der Weltreligionen und ohne Frage eine der Hauptursachen fÃ¼r den weltweiten islamistischen Terrorismus. Gewiss, es gibt auch Verse aus der mekkanischen Ã„ra Mohammeds, in welcher er versucht hat, mit relativ friedlichen Mitteln die schon lange vor der Entstehung des Islam im Vorderen Orient lebenden Juden und Christen fÃ¼r seine neue Religion einzunehmen. Doch nach seiner Vertreibung nach Medina durch eben jene Christen und Juden (622) Ã¤nderte Mohammed radikal seine Strategie gegenÃ¼ber den “UnglÃ¤ubigen”, wie der muslimische Sammelbegriff gegenÃ¼ber allen Nicht-Muslimen bis auf den heutigen Tag lautet. Wer nicht zum Islam Ã¼bertrat, wurde verfolgt, getÃ¶tet oder versklavt. Ein besonders brutales Vorgehen zeigte Mohammed dabei im Jahre 627 n.Chr. gegenÃ¼ber dem jÃ¼dischen Stamm der Quraiza (Banu Kureiza): in seinem Bestreben, Medina “judenrein” zu machen, lieÃŸ er siebenhundert MÃ¤nner dieses jÃ¼dischen Stammes (andere Quellen berichten von Ã¼ber tausend MÃ¤nnern) enthaupten und deren Frauen und Kinder versklaven. Es wird berichtet, dass Mohammed bei diesem Massaker selbst aktiv teilgenommen haben soll. Die Juden- und Christenverfolgung durch den Islam hat eine lange Tradition und geht bis auf die Tage Mohammeds zurÃ¼ck. In der Geschichte des Islam gab es zwar immer wieder Zeiten einer relativ friedlichen Koexistenz zwischen Muslimen und “UnglÃ¤ubigen”. Doch diese waren vom Ã¶ffentlichen Leben weitestgehend ausgeschlossen und wurden mit der “Dhimmi”-Steuer, der Sondersteuer fÃ¼r “UnglÃ¤ubige” belegt. Dhimmis, zu denen Juden und Christen zÃ¤hlen, haben kein Recht, Waffen zu tragen, auch dÃ¼rfen sie (bis zum heutigen Tage) die heiligen StÃ¤dte Medina und Mekka nicht betreten. MÃ¤nnliche Dhimmis dÃ¼rfen keine Muslimin heiraten â€“ umgekehrt jedoch ist es mÃ¶glich (die geheirateten weibliche Dhimmis wurden bis heute stets zwangsislamisiert) Eine Zeugenaussage eines Dhimmis gegenÃ¼ber einem Muslimen hat vor Gericht keinen Wert. Ein besonders groteskes Beispiel fiel Napoleon auf: Bei seinem Ã„gypten-Feldzug bemerkte er MÃ¤nner, die verkehrt herum auf ihren Pferden saÃŸen. Auf seine Nachfrage, was dies fÃ¼r eine merkwÃ¼rdige Sitte sei, erfuhr er, dass dies die in Ã„gypten vorgeschriebene Reiterhaltung fÃ¼r UnglÃ¤ubige (Dhimmis) sei. In kaum einer Zeit wurden die Christen so stark verfolgt wie in der Gegenwart. Nach Quellen der “Evangelischen Allianz” wird alle drei Minuten ein Christ wegen seines Glaubens hingerichtet â€“ Ã¼berwiegend in islamischen LÃ¤ndern. Die “Katholische Kirche Schweiz” berichtet, dass pro Jahr 100.000 Christen wegen ihres Glaubens von Muslimen ermordet oder zu Tode gefoltert werden. Jeder zehnte Christ ist nach Angaben der “Internationalen Gesellschaft fÃ¼r Menschenrechte” Opfer von Diskriminierung und Gewalt. Laut dem Weltverfolgungsindex der Menschenrechtsorganisation “OpenDoors” aus dem Jahre 2006 sind Christen die weltweit meistverfolgte Religion. “Millionen Christen leiden wegen ihres Glaubens unter Benachteiligungen oder Verfolgung â€“ sei es in islamischen LÃ¤ndern, totalitÃ¤ren Staaten oder in Gebieten, in denen Gewalt herrscht. Sie gelten hÃ¤ufig als BÃ¼rger zweiter Klasse, denen selbst humanitÃ¤re Grundrechte verwehrt werden”, lautet das vernichtende Urteil von OpenDoors zur Menschenrechtssituation der Christen. Das Fazit dieser weltumspannenden Studie ist erschreckend und aufschlussreich zugleich. : In 6 der 10 LÃ¤nder mit der schÃ¤rfsten Christenverfolgung sowie in 37 der 50 erfassten LÃ¤nder herrscht der Islam. In weiteren 7 LÃ¤ndern herrscht eine (Ã¼berwiegend kommunistische) totalitÃ¤re Struktur (Nordkorea, Kuba, China, Vietnam, Laos, WeiÃŸrussland, Bhutan). Kennzeichen der restlichen 6 LÃ¤nder sind meist soziale Unruhen oder langjÃ¤hrige RebellenaufstÃ¤nde (Nepal, SÃ¼dmexiko, Sri Lanka, Kolumbien, Kenia). Ein Fazit der Studie: Die vorherrschende Staatsform aller 50 Verfolgerstaaten ist ein ausgeprÃ¤gter staatlicher oder theokratischer Totalitarismus. Ein Beschluss mit weitreichenden Konsequenzen: So schwand die jÃ¼dische BevÃ¶lkerung in den arabischen Staaten in der Zeit von 1948-2001 um sage und schreibe 91 Prozent von ursprÃ¼nglich 855 000 Bewohnern jÃ¼dischen Glaubens auf die Restsumme von ganzen 7800. Eine ganz aktuelle Form des “ethnic cleansing”, die bislang von der westlichen Presse entweder nicht bemerkt oder totgeschwiegen wird. Wie es um die Lage von Christen im Einzelnen bestellt ist, soll in der Folge am Beispiel von zehn muslimischen LÃ¤ndern aufgezeigt werden. In Ã„gypten lebten die koptischen Christen schon Jahrhunderte, bevor der Islam Staatsreligion wurde. Lange Zeit gab es – unterbrochen von immer wieder aufflammenden interreligiÃ¶sen Feindseligkeiten – ein relativ friedliches Nebeneinander, bis sich die Situation durch die GrÃ¼ndung der Muslimbruderschaft 1928 durch den Ã¤gyptischen Fundamentalisten Hasan al-Banna in den 20er Jahren des letzten Jahrhunderts drastisch zuungunsten der Christen des Landes Ã¤nderte. Das Ziel der Muslimbruderschaft ist kein geringeres als eine islamische Weltrevolution mit dem Ausblick eines globalen islamischen Weltstaates. Alle islamistischen Terrororganisationen wie Hamas, Hisbollah, Al Kaida, Taliban oder die Kaukasus-Islamisten berufen sich auf die Schriften der Ã¤gyptischen MuslimbrÃ¼der und insbesondere auf die des GrÃ¼nders al-Banna. Rein formell herrscht in Ã„gypten zwar Religionsfreiheit. Doch die Praxis sieht anders aus. So werden immer wieder Ã¤gyptische Christinnen von Muslimen entfÃ¼hrt und nach ihrer Zwangsislamisierung mit einem Ã¤gyptischen Muslim zwangsverheiratet. Ein ZurÃ¼ck in die christliche Religion ist fÃ¼r diese Frauen so gut wie ausgeschlossen. Und immer wieder werden christliche Kirchen von Muslimen angegriffen oder HÃ¤user koptischer Christen zerstÃ¶rt. Im Februar 2007 nahm die Polizei im oberÃ¤gyptischen Armant zwei koptisch-orthodoxe Familien fest, nachdem diese zur Polizeistation gekommen waren, um BrandanschlÃ¤ge auf ihre HÃ¤user anzuzeigen. “Die Kopten wurden von der Polizei gezwungen ein Protokoll zu unterzeichnen, wonach sie ihre HÃ¤user selbst angezÃ¼ndet hÃ¤tten, um die Tat Muslimen anzulasten und Polizeischutz einzufordern”, berichtet die Internationale Gesellschaft fÃ¼r Menschenrechte IGFM. Vier von zahlreichen anderen durch Muslime in Ã„gypten entfÃ¼hrte und zwangsverheiratete Christinnen. Am Ende stehen Schleier, Zwangsheirat mit einem Fremden und das Scharia-Gesetz. Die Schreie der EntfÃ¼hrten verhallen ebenso ungehÃ¶rt wie das Flehen ihrer Eltern. Feindseligkeiten gegenÃ¼ber Christen sind in Ã„gypten in den letzten 50 Jahren stark gewachsen. So gab es im Oktober 2005 in Alexandria einen Gewaltausbruch gegenÃ¼ber Christen, nachdem die MuslimbrÃ¼der Ã¼ber 20.000 Kopien einer DVD unter Muslimen verteilt hatten mit Texten angeblicher anti-islamischer Predigten seitens der Kopten. Drei Menschen wurden bei diesem Aufruhr getÃ¶tet, sieben Kirchen beschÃ¤digt und eine Nonne durch eine Messerattacke schwer verletzt. Alle muslimischen MordverdÃ¤chtigen der Angriffe vom Januar 2000 in El Kosheh wurden mittlerweile freigelassen, nachdem das Interesse der WeltÃ¶ffentlichkeit an diesem Massaker verblasst war. Im westafrikanischen Kamerun versuchen islamische Fundamentalisten, religiÃ¶se Unruhen zu entfachen. Vor allem aus dem benachbarten Nigeria dringen immer wieder islamische Gotteskrieger ein und schÃ¼ren mit FlugblÃ¤ttern den Hass gegen Christen. Bei ihren AktivitÃ¤ten werden sie dabei logistisch und finanziell von der Al Kaida unterstÃ¼tzt. Islamische Extremisten rufen junge Muslime dazu auf, Christen aus dem Land zu jagen. Nach Kirchenangaben wurden bereits zahlreiche christliche Familien mit Gewalt aus ihren HÃ¤usern vertrieben. DarÃ¼ber hinaus werden junge Muslime aufgefordert, Christinnen zu heiraten und sie zum Ãœbertritt in den Islam zu zwingen und auf diese Weise allmÃ¤hlich den muslimischen BevÃ¶lkerungsanteil zu erhÃ¶hen. Diese Methode geht bis auf die Zeiten Mohammeds zurÃ¼ck und hat sich in der Geschichte der weltweiten Ausbreitung des Islam als KÃ¶nigsweg im weltweiten Eroberungszug des Islam erwiesen und ist â€“ nebenbei bemerkt â€“ auch die Hauptursache der Konversionen zum Islam in den westlichen LÃ¤ndern. Wie die evangelische Nachrichtenagentur “idea” am 5. September 2005 berichtete, werden im muslimischen Eritrea immer mehr Evangelikale verhaftet und unter Druck gesetzt, ihrem Glauben zugunsten des Islam abzuschwÃ¶ren. Dabei liegt die HÃ¤rte der Verfolgungen ganz im Ermessen der BehÃ¶rden. In den letzten Jahren sind Verhaftungen von 883 Christen aus zwÃ¶lf fÃ¼r illegal erklÃ¤rten Religionsgemeinschaften bekannt geworden. 16 prominente Pfarrer wurden ins GefÃ¤ngnis geworfen, darunter vor mehr als einem Jahr Pfarrer Haile Naizgi, der Leiter der grÃ¶ÃŸten Pfingstgemeinde Eritreas, Dr. Kifle Gebremeskel, Vorsitzender der Eritreischen Evangelischen Allianz sowie Pfarrer Tesfatsion Hagos von der evangelischen Rema-Kirche in Asmara. Am 17. September 2006 wurde eine italienische Nonne in der somalischen Hauptstadt Mogadischu von islamistischen Rebellen erschossen. Bei dem Angriff in einem Krankenhaus wurde auch ihr somalischer Mitarbeiter getÃ¶tet. Laut inoffiziellen somalischen Informationen steht das Verbrechen im Zusammenhang mit den Protesten gegen die Islam-Ã„uÃŸerungen von Papst Benedikt XVI. wÃ¤hrend seiner Regensburger Rede. Selbst im laizistischen Vorzeigestaat TÃ¼rkei hat sich das Blatt gewendet. Die TÃ¼rkei, dereinst von ihrem GrÃ¼nder AttatÃ¼rk als moderner, westlich ausgerichteter Staat gedacht, wandelte sich in den letzten Jahrzehnten zunehmend in Richtung eines islamischen Fundamentalstaates. Ihr derzeitiger PrÃ¤sident Erdogan sowie der amtierende AuÃŸenminister GÃ¼l machen aus ihrer islamistischen Einstellung keinen Hehl. Unter manchen Europapolitikern ist unvergessen, was Erdogan als Mitverfasser eines Manifests seiner Partei 1997 empfahl: Die Vernichtung aller Juden und den Kampf gegen den Westen, indem man die “Demokratie nicht als Ziel, sondern als Mittel” begreift. Wie Erdogan oder andere MuslimfÃ¼hrer heute wurde zu seiner Zeit auch Goebbels von niemandem so recht ernst genommen. Der StaatsgrÃ¼nder AttatÃ¼rk selbst wÃ¼rde in der jetzigen TÃ¼rkei als “UnglÃ¤ubiger” und Feind des tÃ¼rkischen Volkes gebrandmarkt. War doch fÃ¼r ihn der Islam nichts weiter als “die absurde Theologie eines unmoralischen Beduinen.” Seltsam nur, dass diese Worte ihres StaatsgrÃ¼nders bis zum heutigen Tage weder von tÃ¼rkischen noch Muslimen anderer Saaten als Prophetenbeleidigung verstanden werden. Von dereinst 250.000 Griechisch-Orthodoxen in Istanbul sind knapp 2.000 Ã¼briggeblieben, von mehr als 2 Millionen christlichen Armeniern (in osmanischer Zeit) leben noch ganze 80.000 im Land. Die Ermordung von mehr als 1,5 Millionen christlicher Armenier durch die Jung-TÃ¼rken gilt unter Historikern als erster Genozid im 20. Jahrhundert. Claude Mutafian (UniversitÃ¤t Paris) schilderte die Geschichte der tÃ¼rkischen Verleugnung des VÃ¶lkermordes. Kemal AttatÃ¼rk, GrÃ¼nder der TÃ¼rkei, verleugnete die Existenz der Armenier, um den Anspruch der TÃ¼rkvÃ¶lker aus Mittelasien auf die TÃ¼rkei zu rechtfertigen. Erst 1965, mit dem Segen der Sowjetunion, “erwachten die Armenier”, um den NATO-Partner TÃ¼rkei an den Pranger zu stellen. Die TÃ¼rkei hingegen spricht bis zum heutigen Tag von einem “Aufstand der Armenier” und “tragischen Kriegsereignissen”. Raymond Kevorkian, UniversitÃ¤t Paris, beschrieb die Radikalisierung der JungtÃ¼rken nach den Balkankriegen und dem Zusammenbruch des Osmanischen Reiches. “Der Prozess eines sozialen Darwinismus setzte ein. FÃ¼r die TÃ¼rken galt gegenÃ¼ber den Armeniern, der grÃ¶ÃŸten nicht-tÃ¼rkischen Volksgruppe neben Griechen, Juden und arabischen Syrern, das Prinzip: du oder ich.” Kevorkian erzÃ¤hlt, wie die Armenier ausgeraubt, deportiert und schlieÃŸlich ermordet wurden. Den JungtÃ¼rken ging es um eine “demografische Homogenisierung”. Im MÃ¤rz 1915 wurden “Sondereinheiten” zwecks “Liquidierung” der Armenier eingesetzt. Sie wurden in 30 “SchlachthÃ¤usern” konzentriert. Beim Euphrates wurden sie durch enge Schluchten gejagt. Frauen und Kinder wurden “ausgefiltert”, wÃ¤hrend die MÃ¤nner ermordet wurden. Die Befehle kamen per Feldtelefon. Die MÃ¶rder behaupteten, “Dienst fÃ¼r die Heimat” geleistet und “FremdkÃ¶rper entfernt” zu haben. Obgleich dem Islam abgeneigt, hÃ¤tten die JungtÃ¼rken die Religion fÃ¼r einen “ethnischen Nationalismus” instrumentalisiert. Vergessen ist der zeitgleich stattgefundene VÃ¶lkermord an Ã¼ber 500.000 christlichen AramÃ¤ern. Die Leidensgeschichte der aramÃ¤ischen Christen ist weitgehend unbekannt; der ottomanisch-tÃ¼rkische Massenmord an Ã¼ber 500.000 von ihnen im Ersten Weltkrieg ist bisher von keinem einzigen Staat offiziell verurteilt worden. Der heute in der Schweiz lebende AramÃ¤er Simon sieht fÃ¼r die aramÃ¤ischen Christen in der TÃ¼rkei keine Zukunft: “Aufgrund von AnschlÃ¤gen und Diskriminierung leben nur noch zwei- bis dreitausend aramÃ¤ische Christen in der TÃ¼rkei. Hunderttausende sind wie ich ins Ausland ausgewandert oder geflohen. In wenigen Jahrzehnten werden wohl nur noch GeschichtsbÃ¼cher Ã¼ber das einstmals blÃ¼hende Leben der aramÃ¤ischen Christen in der TÃ¼rkei Auskunft geben. Ohne UnterstÃ¼tzung einer breiten Ã–ffentlichkeit im Ausland kÃ¶nnen die aramÃ¤ischen Christen in der TÃ¼rkei nicht Ã¼berleben.” Heute ist der Islamunterricht an der Volksschule fÃ¼r die wenigen Ã¼briggebliebenen aramÃ¤ischen Christen in der TÃ¼rkei obligatorisch. Wer als Christ beim Staat arbeitet oder in der Armee dient, muss massive Benachteiligungen in Kauf nehmen. In der TÃ¼rkei, die diese beiden VÃ¶lkermorde bis zum heutigen Tag vehement bestreitet, steht bereits die Ã¶ffentliche ErwÃ¤hnung des Genozids an den Armeniern bis heute unter schwerer Strafe. Derzeit stellen in der TÃ¼rkei alle Christen zusammen, einschlieÃŸlich der AuslÃ¤nder, einen BevÃ¶lkerungsanteil von weniger als einem Prozent â€“ Tendenz sinkend. Entgegen den offiziellen tÃ¼rkischen Verlautbarungen fÃ¼hren Christen dort ein Dasein als BÃ¼rger zweiter Klasse. Kirchlichen BaumaÃŸnahmen wird mit erheblichen Schikanen begegnet, kirchliche Einrichtungen werden immer wieder enteignet. Selbst kleinste bauliche Ã„nderungen oder RenovierungsmaÃŸnahmen an den Kirchen bedÃ¼rfen der staatlichen Genehmigung. Oft warten die Gemeinden Jahre, bis eine solche eintrifft – wenn Ã¼berhaupt. 1971 wurde die theologische Hochschule der griechisch-orthodoxen Kirche geschlossen, und im Jahre 1997 wurde den syrisch-orthodoxen KlÃ¶stern verboten, die aramÃ¤ische Sprache zu lehren. Gleichzeitig sprieÃŸen die tÃ¼rkisch beeinflussten Moscheen in Europa wie Pilze aus dem Boden. In Deutschland etwa gab es im Jahre 1970 gerade mal 3 Moscheen. 1997 waren es bereits Ã¼ber 2700. Die Internationale Gesellschaft fÃ¼r Menschenrechte und die evangelische Nachrichtenagentur idea haben den tÃ¼rkischen evangelischen Pastor Ahment Guvener zum “Verfolgten Christen des Monats 2003” benannt . Im April 2003 wurde Pater Perre Brunissen bei einer islamistisch motivierten Messerattacke in der sÃ¼dtÃ¼rkischen Stadt Samsun schwer verletzt. Zweien zum Christentum konvertierten TÃ¼rken, Hakan Tastan (37) und Turan Topal (46), drohen neun Jahre GefÃ¤ngnis. Der Vorwurf: Sie hÃ¤tten den Islam beleidigt ( Artikel 216 der tÃ¼rkischen Verfassung) und “vertrauliche Informationen Ã¼ber StaatsbÃ¼rger gesammelt” (Artikel 135). Im Februar 2006 wurde der katholische Priester Andrea Santoro bei einem Gebet in der Stadt Trabzon am Schwarzen Meer von einem tÃ¼rkischen Islamisten hinterrÃ¼cks erschossen. Der MÃ¶rder schrie: “Allah ist groÃŸ!”, bevor er abdrÃ¼ckte. In frischer Erinnerung sind die Morde an drei Bibelverlegern im osttÃ¼rkischen Malatya Anfang diesen Jahres. Auffallend zurÃ¼ckhaltend war die Reaktion deutscher Medien auf diese islamistisch motivierten Morde im EU-Bewerberstaat TÃ¼rkei. Kaum ein deutscher Politiker, der es wagte, entgegen der “political correctness” Stellung gegen diese Skandalmorde zu beziehen. Keine deutsche Zeitung wagte es, die VerhÃ¶hnung und Beleidigung der Opfer und deren AngehÃ¶riger in einigen tÃ¼rkischen Zeitungen als Meldung aufzugreifen. Weder MinisterprÃ¤sident Erdogan, noch AuÃŸenminister GÃ¼l, noch der Gouverneur und kein einziger tÃ¼rkischer BÃ¼rgermeister waren bei der Beerdigung dabei. In Nigeria verfolgen die nÃ¶rdlichen, islamistisch orientierten Bundesstaaten weiterhin ihre Politik zur EinfÃ¼hrung der Scharia. Seitdem hat es gegen Christen zahlreiche Prozesse und amtlich angeordnete Auspeitschungen gegeben. Kirchen wurden zerstÃ¶rt oder mussten verlegt werden, um sie aus den muslimischen Gebieten herauszubringen. Infolgedessen hÃ¤lt der Strom von Christen weiter an, die den Norden verlassen. Im islamischen Bundesstaat Zamfara startete der Gouverneur eine gegen Christen gerichtete Kampagne. Zahlreiche Kirchen wurden abgerissen. Dasselbe ist auch fÃ¼r den Bundesstaat Bauchi geplant. Viele Christen entschlossen sich daraufhin zur Abwanderung. Der Bundesstaat Katsina ordnete an, dass Kirchen aus muslimischen Gebieten entfernt werden mÃ¼ssen. Im Bundesstaat Gombe wurden Kirchen angezÃ¼ndet. RÃ¼ckblickend sagt die nigerianische Kirche, dass 89 ihrer Mitglieder wÃ¤hrend der Unruhen des Jahres 2000 in Kaduna getÃ¶tet wurden. Saudi Arabien, die Heimat des Islam, zÃ¤hlt zu den fÃ¼r Christen am bedrohlichsten Staaten. Im ganzen Land gibt es nicht ein einziges KirchengebÃ¤ude, obwohl ein Drittel der BevÃ¶lkerung Gastarbeiter sind, unter denen es auch viele Christen gibt. WÃ¤hrend ihres ganzen, manchmal jahrelangen Aufenthaltes, dÃ¼rfen sie in der Ã–ffentlichkeit keine christlichen Symbole zeigen, nicht die Bibel lesen und sich schon gar nicht zu Gottesdiensten oder Bibelkreisen versammeln. FrÃ¼her wurden Christen, die bei ihrer GlaubensausÃ¼bung erwischt wurden, einfach ausgewiesen. Mittlerweile hÃ¤ufen sich nÃ¤chtliche Razzien, bei denen Christen in GefÃ¤ngnisse gesteckt und ihre Computer, Bibeln, Kassetten und Familienfotos konfisziert werden. Im Lehrbuch fÃ¼r die erste Klasse wird SchÃ¼lern beigebracht, dass Juden, Christen und andere Nicht-Muslime fÃ¼r das “HÃ¶llenfeuer” bestimmt sind. Zitat aus dem Buch: “Jede Religion auÃŸer dem Islam ist falsch!”. Ein Lehrbuch fÃ¼r die vierte Klasse verlangt als Erfordernis von “wahrem Glauben” von den SchÃ¼lern, “Polytheisten und UnglÃ¤ubige zu hassen (tubghida).” Das Lehrbuch fÃ¼r die achte Klasse warnt davor, die “UnglÃ¤ubigen zu imitieren” und weist die SchÃ¼ler an, “verdammenswerte CharakterzÃ¼ge” bei Juden zu entdecken. Es lehrt sie auch, dass unter die “UnglÃ¤ubigen” diejenigen Muslime zu zÃ¤hlen seien, die nicht der saudisch-wahabbitischen Glaubenspraxis folgen. Im einem Lehrbuch fÃ¼r die neunte Klasse lernen die saudischen Teenager in apokalyptisch formulierten Worten, dass Gewalt gegen Christen, Juden und andere UnglÃ¤ubige von Gott gebilligt wird. SchlieÃŸlich weist ein Lehrbuch fÃ¼r die elfte Klassen (Jungen) im Fach “Management, Sozialkunde, Naturkunde und technische Studien” Muslime an, keine UnglÃ¤ubigen zu grÃ¼ÃŸen und keine HÃ¶flichkeiten mit ihnen auszutauschen. Der GruÃŸ “Friede sei mit Dir!” sei ausschlieÃŸlich fÃ¼r die (wahabbitischen) GlÃ¤ubigen vorgesehen. Er kann anderen nicht entboten werden. Wir erinnern uns: Der GroÃŸteil der Terroristen vom 11. September waren StaatsangehÃ¶rige Saudi-Arabiens. Im islamistischen Sudan wird die christliche Minderheit seit 1986 verstÃ¤rkt verfolgt. Christliche Schulen, KrankenhÃ¤user und Kirchen werden gezielt bombardiert, christliche Leiter ermordet. Christen werden als Sklaven verkauft, LÃ¤ndereien von Christen beschlagnahmt und Arabern Ã¼bergeben. Im Norden gibt es fÃ¼r FlÃ¼chtlinge eine “Nahrungsmittel-fÃ¼r-ReligionsÃ¼bertritt-Politik”. Man glaubt es kaum: Doch insbesondere im islamischen Ferienparadies Malediven hat die muslimische Gewalt gegen Christen dramatisch zugenommen. Im Christenverfolgungsindex von OpenDoors rangiert der kleine Inselstaat mittlerweile auf Rang acht. Auf dieser zu den beliebtesten Urlaubszielen zÃ¤hlende Inselgruppe ist Religionsfreiheit ein Fremdwort. Christen und AnhÃ¤nger anderer Minderheitsreligionen werden schwer benachteiligt. Einheimischen Muslimen droht bei einem Religionswechsel der Verlust der StaatsbÃ¼rgerschaft. Der Bau von Kirchen und anderen nicht-muslimischen GebetsstÃ¤tten ist verboten, jeder Ã¶ffentliche christliche Gottesdienst unter den 20.000 auslÃ¤ndischen ArbeitskrÃ¤ften sowie den jÃ¤hrlich hunderttausenden Touristen ist untersagt. Aus dem muslimischen Pakistan wird immer wieder von EntfÃ¼hrungen christlicher MÃ¤dchen durch Muslime berichtet. Eine junge Christin ist eingekerkert worden, nachdem sie einer Schulfreundin von Christus erzÃ¤hlte. Den Eltern erzÃ¤hlte man, ihre Tochter habe den Wunsch geÃ¤uÃŸert, ihr christliches Zuhause verlassen zu wollen, weil sie sich zum Islam bekehrt habe. Die Ã¶rtliche Polizei lehnte die Bearbeitung einer Anzeige der Eltern ab, weil man sowieso nicht wisse, wo sich die Tochter im Moment aufhalte. Christen in Pakistan mÃ¼ssen jederzeit mit der Todesstrafe durch den Strang wegen “GotteslÃ¤sterung gegen den Namen des Heiligen Propheten Mohammed” rechnen. Jahrzehntelang wurde Indonesien, der mit Ã¼ber 200 Millionen Menschen bevÃ¶lkerungsreichste islamische Staat, als beispielhaft fÃ¼r interreligiÃ¶se Toleranz angesehen. Doch damit ist es â€“ nicht erst seit den Bali-AnschlÃ¤gen mit seinen 226 Totenâ€“ definitiv vorbei. Unter massiver Einflussnahme seitens der iranischen Mullahkratie und saudischer Wahabbiten kam es zu einer erschreckenden Radikalisierung der Muslime in Indonesien. Dies wiederum fÃ¼hrte zu religiÃ¶ser Gewalt, wobei die Minderheit der im Lande lebenden Christen zu leichten Zielen wurden. Die Inselgruppe der Molukken wurde dabei zum Hauptschlachtfeld. Laskar Jihad, eine besonders radikale muslimische Bewegung, hat sich zum Ziel gesetzt, das Christentum in diesem Gebiet gÃ¤nzlich auszulÃ¶schen. Am 25. April 2004 wurden in der Provinzhauptstadt Ambon der Direktor eines evangelikalen Bibelseminars und ein Student grausam ermordet. Vor ihrer Enthauptung wurden sie gefoltert, ihre Leichen wurden danach verbrannt. Auf der Insel Sulawesi, einem der regionalen RÃ¼ckzugsgebiete der Christen, wurden drei christliche SchÃ¼lerinnen im Alter von 15, 16 und 19 Jahren von muslimischen Extremisten Ã¼berfallen und enthauptet. Sie waren auf dem Weg zu ihrer christlichen Schule. Ein viertes MÃ¤dchen Ã¼berlebte schwer verletzt. Ihr Gesicht ist durch eine Machete gespalten worden. Trotz zahlreicher plastischer Operationen wird dieses MÃ¤dchen sein Leben lang entstellt sein. Am 10. Oktober 1996 hat in der Stadt Situbondo, im Osten Javas, eine Menge von ca. 3.000 Muslimen 30 Kirchen Ã¼berfallen und in Brand gesetzt, wobei sechs Personen getÃ¶tet wurden. Die Menge war aufgebracht wegen des zu milden Urteils, das Ã¼ber einen jungen Muslim namens Saleh verhÃ¤ngt worden war. Die AufstÃ¤ndischen, die sehr wahrscheinlich von wohlorganisierten Agitatoren aufgewiegelt worden waren, waren Ã¼berzeugt, daÃŸ der junge Saleh in der NÃ¤he einer der Kirchen der Stadt versteckt worden sei und verdÃ¤chtigten indonesische Christen, Saleh vor ihrem Zorn zu schÃ¼tzen. Aufgrund dieser GerÃ¼chte Ã¼berfielen sie KultstÃ¤tten, Schulen, WaisenhÃ¤user und Privatwohnungen, alle GebÃ¤ude, die im Zusammenhang mit den Christen standen. Ein Pastor der evangelischen Kirche, seine Frau und deren Kinder, waren zusammen mit einem MÃ¤dchen und einem Helfer in einem der GebÃ¤ude eingeschlossen und sind bei lebendigem Leibe verbrannt. Nach Angaben der Verantwortlichen der protestantischen Konfession (auch aufgrund von Augenzeugen und Polizeiberichten) soll der Aufruhr geplant und von Agitatoren, die integralistischen Gruppen angehÃ¶ren, gut organisiert worden sein. Das habe sich auch erwiesen, so bestÃ¤tigt die Presseagentur U.C.A. News vom 14.-24. Oktober 1996, durch die Schnelligkeit, mit der die ÃœberfÃ¤lle auf die Kirche durchgefÃ¼hrt worden seien: Die BrandsÃ¤tze waren unmittelbar verfÃ¼gbar, und die verschiedenen Gruppen gingen koordiniert vor. Am 26. Dezember 1996 wurden im Westen der Insel Java, in Tasik Malaya, 13 Kirchen und eine christliche Schule zerstÃ¶rt. Idea Spektrum berichtet, dass die Ãœbergriffe im Zuge eines Aufstands islamischer Extremisten erfolgten, die RegierungsgebÃ¤ude, Schulen, Fabriken und Banken getroffen haben. Auch zwei Ehepaare seien in ihren Fahrzeugen getÃ¶tet worden. Ein anderer Vorfall ereignete sich in Manang (Zentral-Java), wo etwa 50 junge Muslime in den Verlauf eines Gottesdienstes in der Weihnachtsnacht eingedrungen sind, den Priester geschlagen haben, bis er bewuÃŸtlos wurde, Mobiliar stahlen und die Decke des Versammlungsraumes zerstÃ¶rten. AuÃŸerdem erklÃ¤rten die Jugendlichen, daÃŸ es in ihrem Dorf in Zukunft nicht erlaubt wÃ¤re, Christ zu sein und religiÃ¶sen Feiern abzuhalten. Am 30. Januar 1997 zerstÃ¶rten die Integralisten zahlreiche Kirchen, einen chinesischen Tempel und das GeschÃ¤ft eines chinesischen Christen. Sie brachen ein in Rengasdengklok, ca. 50 Kilometer von Jakarta, und griffen die GebÃ¤ude mit Steinen und StÃ¶cken an. Nach Angaben der Ã¶rtlichen Polizei gab es keine Verletzten. Ende Dezember wurden in der Stadt Tasik Malaya, im Westen Javas, vier Christen getÃ¶tet und 15 verletzt. Mehr als 100 GebÃ¤ude und zwÃ¶lf christliche Kirchen wurden stark beschÃ¤digt. In Situbondo starben fÃ¼nf Menschen, der protestantische Pfarrer Isaac Christian, seine Frau und deren drei Kinder; 25 Kirchen und ein Tempel wurden zerstÃ¶rt. Die indonesischen Chinesen und die christliche Minderheit sind immer im Visier muslimischer AnschlÃ¤ge, die nicht zuletzt wegen der miserablen wirtschaftlichen Lage organisiert werden. DarÃ¼ber hinaus mÃ¶chten militante Kreise den Islam zur einzigen fÃ¼r alle verbindlichen Religion des Landes machen. In den beiden letzten Jahren sind 1300 GebÃ¤ude der katholischen Kirche schwer beschÃ¤digt worden. Doch weltweit beteuern islamische Geistliche unentwegt, Islam bedeute Frieden. Wie um diesen Befund zu untermauern wusste Ayatollah Chameini, derzeit oberster geistlicher FÃ¼hrer und damit Chef im Iran (bei seinen Ansprachen stets mit belehrend erhobenem Zeigefinger gestikulierend), die wahren Friedensprinzipien des Islam mit folgenden Worten zu charakterisieren: “Wirf deine Gebetsschnur fort und kaufe dir ein Gewehr. Denn GebetsschnÃ¼re halten dich still, wÃ¤hrend Gewehre die Feinde des Islam verstummen lassen! Wir kennen keine absoluten Werte auÃŸer der totalen Unterwerfung unter den Willen des allmÃ¤chtigen Allahs. Die Christen und Juden sagen: “Du sollst nicht tÃ¶ten!” Wir aber sagen, dass “das TÃ¶ten einem Gebet an Bedeutung gleichkommt, wenn es nÃ¶tig ist!” (Zitat aus einer seiner Reden im Jahr 2004). Al-Sarkawi, bis zu seiner TÃ¶tung durch die Amerikaner Stellvertreter von Al-Kaida im Irak, auch bekannt als “Der SchlÃ¤chter des Irak”, rief zum Dschihad auf, der den Islam und die Scharia auf der ganzen Welt verbreiten soll. “Die Angriffe (Anm. : im Irak) werden erst nach einem weltweiten Sieg des Islam und der Errichtung der Scharia aufhÃ¶ren”, so Sarkawi. Dieser Satz muss in den Ohren westlicher Gutmenschen und notorischer Amerikakritiker schmerzen. Zeigt er doch, dass die heftig kritisierte US-Operation im Irak nicht wie stets behauptet Ursache, sondern lediglich (seitens der Islamisten) willkommener Anlass fÃ¼r einen weltweiten Dschihad ist. Den Auftrag zur Weltherrschaft erhalten die Muslime von Allah persÃ¶nlich. Aus dem Munde seines Propheten erfahren die GlÃ¤ubigen: “Er ist’s (Allah), der seinen Gesandten (Mohammed) mit der Leitung und der Religion der Wahrheit entsandt hat, um sie Ã¼ber jede Religion siegreich zu machen, auch wenn es den GÃ¶tzendienern zuwider ist.” (Heiliger Koran, Sure 61, Vers 9). In Sure 98 Vers 6 lÃ¤ÃŸt Allah keinen Zweifel daran, was von den “UnglÃ¤ubigen” zu halten ist: “Siehe, die UnglÃ¤ubigen vom Volke der Schrift (Anm. : gemeint sind Juden und Christen)…sie sind die schlechtesten aller GeschÃ¶pfe!” Und damit jedermann weiÃŸ, wenn Allah zu den UnglÃ¤ubigen zÃ¤hlt, wird dieser Begriff geradezu im Stil einer wissenschaftlich-semantischen Begriffsbestimmung unzweideutig definiert: “UnglÃ¤ubig sind gewiss diejenigen, die sagen: Christus, der Sohn Marias, ist Gott!” (Sure 5 Vers 17). Was muslimische Theologen darÃ¼ber hinaus noch allzu gerne gegenÃ¼ber westlichen Medien verschweigen ist Mohammeds klare Aussage, wie mit Menschen zu verfahren sei, die sich der Apostasie (des Glaubensabfalls) vom Islam schuldig gemacht haben. “TÃ¶tet denjenigen, der seine Religion wechselt!”, wird Mohammed in der Hadith (den Ãœberlieferungen des Lebens Mohammeds) zitiert. Eine andere muslimische Quelle berichtet, dass Mohammed seine Feinde und Gegner regelmÃ¤ÃŸig durch AuftragsmÃ¶rder umbringen lieÃŸ, darunter Dichter, Frauen und vor allem Juden (Tabari VII:97/Ishaq:368). Wer weiÃŸ, dass fÃ¼r glÃ¤ubige Muslime die Ãœberlieferungen zu Mohammeds Leben neben dem Koran die zweite wichtige GlaubenssÃ¤ule darstellen, sieht die Todesfatwas, die seit Jahrhunderten bis in die Gegenwart hinein (Salman Rushdie) gegen Kritiker und Feinde des Islam ausgestellt werden, damit nicht als Irrweisungen verblendeter Fanatiker, sondern als ein zentrales, heiliges Werkzeug der islamischen Glaubenstradition selbst: Gehen diese Fatwas doch auf den ReligionsgrÃ¼nder selbst zurÃ¼ck. Wie sehr selbst aufgeklÃ¤rte westliche Orientalisten sich in diesem mittelalterlichen Verfolgungssystem verirren kÃ¶nnen, zeigt sich Ã¼berdeutlich an Annemarie Schimmel, der “Grand Madame” der deutschen Orientalistik, die 1995 fÃ¼r ihr Lebenswerk der VerstÃ¤ndigung zwischen Muslimen und Nichtmuslimen mit dem Friedenspreis des Deutschen Buchhandels ausgezeichnet wurde. In einem Fernsehinterview zeigte sie VerstÃ¤ndnis fÃ¼r die EmpÃ¶rung der islamischen Welt und der Todesfatwa gegen Salman Rushdie wegen dessen islamkritischen Werks Die Satanischen Verse. In einem Berliner Modellversuch wurde an verschiedenen Schulen Islam-Unterricht eingefÃ¼hrt. Nach wenigen Wochen waren die muslimischen SchÃ¼ler kaum mehr zu erkennen: Muslimische MÃ¤dchen erschienen nur noch mit Kopftuch zum Unterricht, Freundschaften zu nicht-muslimischen Klassenkameraden wurden abgebrochen und viele der muslimischen SchÃ¼ler setzten sich nicht mehr mit ihren christlichen Klassenkameraden an eine Schulbank. Muslimische SchÃ¼lerinnen weigerten sich, am Sexualkunde-Unterricht teilzunehmen, gemischter Sportunterricht wurde seitens muslimischer SchÃ¼lerinnen boykottiert. Diese Entwicklung kam nicht von ungefÃ¤hr. Wurden die KoranschÃ¼ler doch im Islamunterricht (der verfassungswidrig der staatlichen Schulaufsicht (Art. 7 Abs. 1 GG) entzogen war) mit Suren wie den folgenden konfrontiert: “O die ihr glaubt. Nehmet nicht die Juden und die Christen zu Freunden. Sie sind Freunde gegeneinander. Und wer von euch sie dennoch zu Freunden nimmt, der gehÃ¶rt fÃ¼rwahr zu ihnen. Wahrlich! Allah weist nicht dem Volk der Ungerechten den Weg!” (Sure 5 Vers 51) oder, noch deutlicher in Sure 8, Vers 55: “Siehe, schlimmer als das Vieh sind bei Allah die UnglÃ¤ubigen, die nicht glauben!” Und damit auch dem letzten Muslim klar wird, welches Verhalten Allah von ihm UnglÃ¤ubigen gegenÃ¼ber verlangt, lÃ¤ÃŸt Mohammed seine RechtglÃ¤ubigen im Koran wissen: “Und wenn ihr die UnglÃ¤ubigen trefft, dann herunter mit dem Haupt, bis ihr ein Gemetzel unter ihnen angerichtet habt; dann schnÃ¼ret die Bande.” (Sure 47, Vers 4-5). Ganz im Einvernehmen dazu Ã¤uÃŸerte sich in Berlin letzten Jahres Alpaslan SÃ¼rÃ¼cÃ¼, der Bruder des TodesschÃ¼tzen von Hatun SÃ¼rÃ¼cÃ¼ (23), nach dem Freispruch des wegen Mordes angeklagten Familienmitglieds vor laufender Kamera folgendermaÃŸen: “Siehst du diese Menschen dort? Wenn man sie umbringt, ist das keine SÃ¼nde. Das sind alles UnglÃ¤ubige!”. (Quelle: Minority Report 2006). Wie bereits erwÃ¤hnt gibt es an 2000 Stellen im Koran und der Hadith, in welchem zum Hass, Mord und zur Verfolgung “UnglÃ¤ubiger” aufgerufen wird. Die Integrationsproblematik der Muslime in nahezu allen westlichen Gesellschaften stellt sich damit in einem etwas anderen Licht dar â€“ auch wenn es von Multikulti-Fanatikern (wie Claudia Roth etwa) vermutlich anders gesehen wird. Ob Roth oder Oskar Lafontaine (letzterer sieht wichtige Gemeinsamkeiten in den Interessen der Links-Partei und der Muslime Deutschlands) allerdings jemals einen Blick in den Koran geworfen haben, bleibt anzuzweifeln. Der Publizist, Schriftsteller und Islam-Kritiker Ralph Giordano hat die von der BÃ¼rgerrechtsbewegung Pax Europa e.V. initiierte Petition zugunsten der Demonstration in BrÃ¼ssel am 11. September 2007 als 2817. Unterzeichner befÃ¼rwortet. Giordano fÃ¼gte seiner Unterschrift den Satz “Nicht die Moschee, sondern der Islam ist das Problem” hinzu. Einen entsprechenden Artikel hatte Giordano auch auf Seite 13 der Frankfurter Allgemeinen Sonntagszeitung (Ausgabe vom 12. August 2007, online nur fÃ¼r Abonnenten) verfasst. Giordano begrÃ¼ÃŸte in einem GesprÃ¤ch mit der gemeinnÃ¼tzigen BÃ¼rgerrechtsbewegung Pax Europa e.V. die Absicht, die Entscheidung des BrÃ¼sseler BÃ¼rgermeisters, die Pax-Europa-Demonstration fÃ¼r den Erhalt der europÃ¤ischen Werte und gegen die schleichende Islamisierung Europas zu verbieten, gerichtlich anzufechten. Er sagte, er hoffe, dass der BÃ¼rgermeister die zum Auftakt der Demonstration geplante und nun ebenfalls abgesagte Schweigeminute in Erinnerung an die Opfer der TerroranschlÃ¤ge des 11. September 2001 doch noch stattfinden lassen werde. An der Demonstration hatten mindestens 20.000 Menschen aus allen Staaten der EuropÃ¤ischen Union teilnehmen wollen, unter ihnen mehr als 800 Juden, 350 Sikhs, 420 Buddhisten, 50 Ex-Muslime, 160 Hindus und zahlreiche Christen, Muslime und Atheisten. Es wÃ¤re die erste multikulturelle BrÃ¼sseler Demonstration aller Religionsgruppen und VÃ¶lker zugunsten der europÃ¤ischen Werte gewesen. Der BrÃ¼sseler BÃ¼rgermeister hatte das Demonstrationsprogramm aus Angst vor den zahlreichen muslimischen Einwohnern BrÃ¼ssels, die den GroÃŸteil seiner WÃ¤hler stellen, und den angeblich von ihnen ausgehenden Gefahren Ã¼berraschend verboten. Giordano begrÃ¼ÃŸte die AnkÃ¼ndigung, den BÃ¼rgermeister zudem strafrechtlich wegen des Verdachts des Amtsmissbrauchs bei der Staatsanwaltschaft BrÃ¼ssel anzuzeigen. Ein GroÃŸteil der Mitglieder der sozialistischen Partei des BÃ¼rgers im BrÃ¼sseler Regionalparlament sind Muslime. Giordano zeigte sich zudem schockiert darÃ¼ber, dass bei den jÃ¼ngsten BrÃ¼sseler Wahlen der gerichtlich bekannte tÃ¼rkischstÃ¤mmige VÃ¶lkermord-Leugner Emir Kir auf der Liste der Sozialisten gewÃ¤hlt worden war (wir berichteten). Giordano berichtet aus seiner Sicht, dass Muslime in Europa nur fordern, ohne sich zu integrieren. Zu Deutschland berichtet er in der FAZ: “BuchstÃ¤blich rot sehe ich auch, wenn die Ditib und andere VerbÃ¤nde wieder einmal penetrant auf Religionsfreiheit pochen – ohne das kleinste parallele BemÃ¼hen um Religionsfreiheit in der TÃ¼rkei. Da wird ein Prinzip sichtbar, das Ã¼ber allen AktivitÃ¤ten muslimischer VerbÃ¤nde steht, eingeschlossen den “Zentralrat der Muslime in Deutschland” (ZDM) oder die “Islamische Gemeinschaft in Deutschland” (IGD): zu fordern, fordern, fordern, ohne jeden Sinn fÃ¼r eine Bringschuld.” Und Girodano empÃ¶rt sich Ã¼ber die Blindheit gegenÃ¼ber den islamischen VÃ¶lkermord-Leugnern in Deutschland: “Dazu wird bekannt, dass Ditib-Imame eine Sonderausbildung erhalten, die den VÃ¶lkermord an den Armeniern 1915/16 im tÃ¼rkisch-osmanischen Reich zu einem “Mythos” erklÃ¤rt – eine “Auschwitz-LÃ¼ge” auf TÃ¼rkisch.” DITIB-Imame sind in vielen deutschen Gemeinden gern gesehene Ansprechpartner fÃ¼r Politik und Kirchen. Ãœberall in Europa schÃ¼tteln unsere Politiker demnach begierig muslimischen VÃ¶lkermord-Leugnern die HÃ¤nde. Wer das offen kritisiert, gilt bei manchen in Europa heute als “radikaler Rassist”. Der Fall sorgt fÃ¼r Aufsehen: Am Dienstag sind drei Islamisten festgenommen worden, die offenbar zum Jahrestag der AnschlÃ¤ge am 11. September 2001 mehrere Attentate in Deutschland geplant haben sollen. Bereits seit vielen Jahren befasst sich der Fernsehjournalist Fritz Schmaldienst mit islamistischen Netzwerken und den Gefahren des Terrors. FÃ¼r die neue Ausgabe des Christlichen Medienmagazins pro haben wir mit ihm Ã¼ber seine Recherchen gesprochen â€“ lesen Sie hier den ersten Teil des GesprÃ¤chs. pro: Herr Schmaldienst, Sie befassen sich seit vielen Jahren als Berichterstatter und Fernsehredakteur auch mit dem Islam. FÃ¼r die SWR-Sendung â€žReport Mainz“ haben Sie etwa eine Reportage Ã¼ber die Verfolgung von ehemaligen Muslimen, die Christen wurden, gedreht. FÃ¼r Aufsehen sorgten jÃ¼ngst Ihre Recherchen Ã¼ber islamistische Terrorzellen in Deutschland. Mit welchem Thema befassen Sie sich aktuell? Fritz Schmaldienst: Ich stehe derzeit in Kontakt zu einem Afghanen in Frankfurt, dessen Sohn sich nach eigenen Angaben zum Dschihad â€žgemeldet“ hat. In einem Abschiedsbrief hatte er seiner Familie mitgeteilt, dass er sie â€žim Paradies wiedersehen“ werde. Ich mÃ¶chte herausfinden, wie Menschen fÃ¼hlen und denken, wenn sich SÃ¶hne aus ihren Reihen abwenden und sich dem radikalen Islam zuwenden. KulturhÃ¤user als Zentrum des Terrors? Zwei der TerrorverdÃ¤chtigen gehÃ¶rten zu den bis zu 100.000 Konvertiten in Deutschland. Sie fÃ¼hlten sich vom salafistischen Islam angezogen, der vor allem vom Hass auf die â€žUnglÃ¤ubigen” lebt. Auch Wissenschaftler wissen, Konvertiten â€žmachen alles 150-prozentig”. Seit einigen Monaten Ã¼berziehen die Mullahs im Iran die BevÃ¶lkerung mit einer neuen Repressionswelle. In deutschen Me dien ist davon kaum etwas zu hÃ¶ren. Nasrin Amirsedghi floh 1980, kurz nach Errichtung der islamischen Diktatur, mit ihrer Tochter aus dem Iran. Die Publizistin, Philologin, Literatur- und Filmwissenschaftlerin lebt in Mainz und ist dort bei Â»DIAÂ«, einem Â»Verein fÃ¼r Kulturâ€‰&â€‰Migra tionÂ« aktiv. Sie spricht sich gegen Islamismus, Kulturrelativismus und die Verharm losung des Regimes in Teheran aus. Wie bewerten Sie die hiesige Debatte Ã¼ber den Iran? Es gibt gar keine Debatte. Wenn Ã¼berhaupt, dann keine vernÃ¼nftige und offene Debatte. In der Bun desrepublik gibt es zwar keine Zensur, aber einen Filter fÃ¼r Informationen, je nach po litischer Macht und nach Laune wird vieles geschÃ¶nt. Man will keine Wahrheit hÃ¶ren, sondern den bestehenden Mist parfÃ¼mieren. DafÃ¼r holt man sich prominente so genannte Iran- und Islam-Experten wie Peter Scholl-Latour oder Udo Steinbach.